DescriptionHaving children fundamentally disrupts and remakes us, in terms of body, identity, perspective, and voice. The world shrinks and exponentially expands. Our already-fraught human experience of time is shredded and magnified. The central tenets of this chapbook: ideas of the body, pregnancy, and motherhood; how becoming a parent destabilizes the self; local anxieties (What if my child doesn’t eat enough? How will I ever sleep again?) and global anxieties (How do we respond to these tumultuous times, full of such hate, racism, and xenophobia? How do we help? ); and the ever-deepening desire to protect those who are (increasingly) threatened. 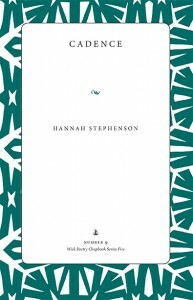 AuthorHannah Stephenson is a poet and editor living in Columbus, Ohio (where she also runs a literary event series called Paging Columbus). In addition to Cadence, she is the author of In the Kettle, the Shriek (Gold Wake Press) and series coeditor of New Poetry from the Midwest (New American Press). Her writing has appeared in The Atlantic, The Huffington Post, 32 Poems, Vela, The Journal, and Poetry Daily.